Sometimes we have interesting ideas that cannot be realized due to the lack of time or resources. We decided to open this section in order to present some of these ideas. We would be glad to receive your feedback and comments. the third idea provides the structure of the management subsystem for the steering, positioning, communication and data transmission between the group/swarm of the flying objects and the ground station. The phase array antenna is formed from the antennas, installed on the drones or other flying or moving objects. These objects are connected together to a swarm. 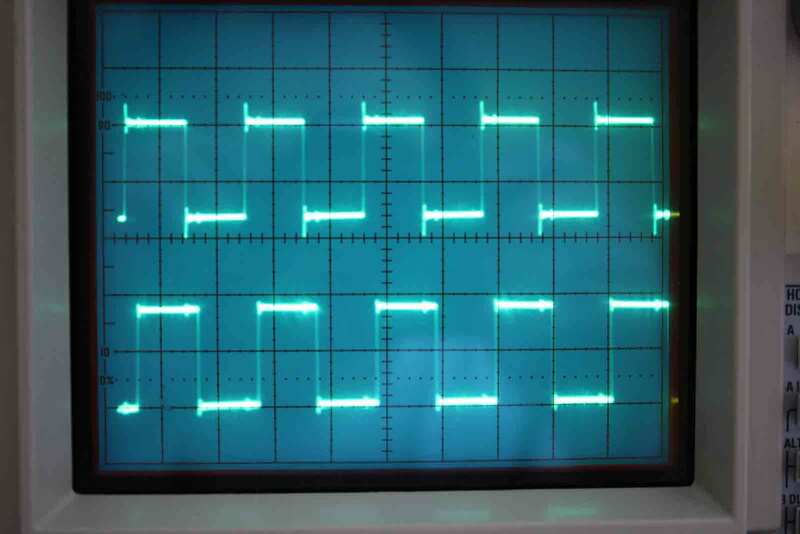 Conventional phased array antennas are commonly used in the typical radar systems. By altering the relative phasing of a group of radiating or receiving elements (elementary antenna) with respect to each other, the beam produced by the overall antenna or the gain pattern of a receiving antenna may be altered. The typical tags for the wildlife tracking have low power transmitter due to the energy constraints. Moreover, the signal is very weak in case of the wildlife tracking in water. Therefore, the signal detection is possible only in the small distance (hundreds of meters) using the sensitive receiver and directional antenna with high gain factor. Antennas with the high gain factory have the narrow beam pattern and are difficult to steer in order to detect the radio beacons. Remark: the quantity of drones provided on the figures are illustrative. 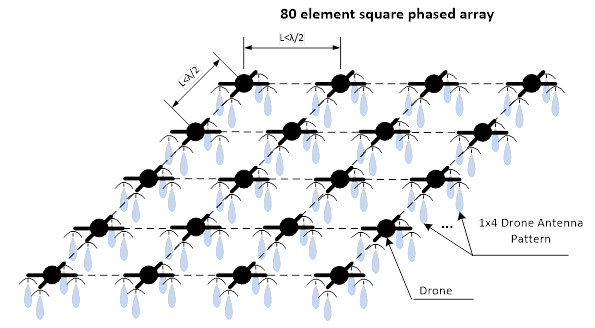 The exact number of the swarm elements can be selected during the system design and based on the frequencies, accuracy and range requirements. The distance and position of the tagged species can be calculated using the current GPS coordinates of the swarm and the angel ϕ: d= h/cosϕ. The distance between single swarm objects (L) must be less than λ/2. In this case the beam forming pattern will be directional and provide a scan without grating lobes. For example: the distance L for the single swarm objects will be 0.9 m in case of the frequency range 162…173 MHz (λ=1,73…1,85m). The phased array consisted of the single antennas and coherent receivers that are located on the flying swarmed or grouping objects can spontaneously change the beam forming factor and beam forming configurations and therefore dynamically change the steering beam. This property enables to scan the bigger areas with the wide beam and after the detection to follow the objects using the narrow beam. 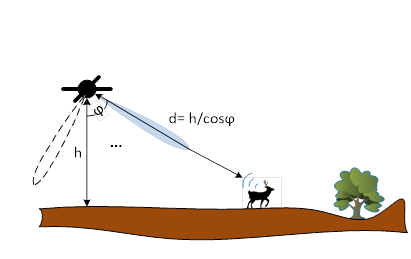 Radio signals with the longer wave lengths can better penetrate in the ground and water surface but require the longer antennas. The flying swarm antennas and SDR receiver can establish all necessary configurations during the operation. Moreover, such systems require much less space and can be faster deployed than comparable fixed/motionless systems on the ground. 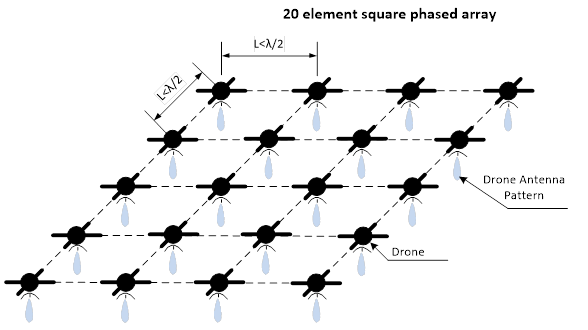 If the flying objects are equipped with SDR coherent transceivers than the probing of the ground/water surface can be done on different frequencies using the advantages of the phased arrays: detection of the weak reflected signals, target positioning. Such mobile radar systems can also be used in the geology, earth exploration or in the military applications.